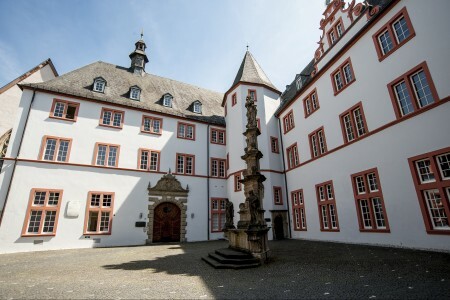 The present building of the Diocesan Theological Seminary is located in a large courtyard at the former Jesuit College, between Brotstrasse and Neustrasse. 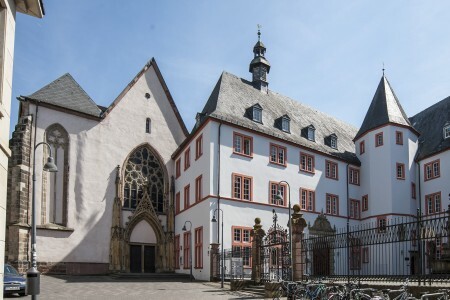 It is a Holy Trinity Church or, simply Jesuit Church, as it is generally known in Trier. Please note: During the services it is not possible to visit the cathedral! 04/22/2019: 09:00 a.m. - 5:00 p.m.
04/23/2019: 09:00 a.m. - 5:00 p.m.
04/24/2019: 09:00 a.m. - 5:00 p.m.
04/25/2019: 09:00 a.m. - 5:00 p.m.
04/26/2019: 09:00 a.m. - 5:00 p.m.
04/27/2019: 09:00 a.m. - 5:00 p.m.
04/28/2019: 09:00 a.m. - 5:00 p.m.
04/29/2019: 09:00 a.m. - 5:00 p.m.
04/30/2019: 09:00 a.m. - 5:00 p.m.
05/01/2019: 09:00 a.m. - 5:00 p.m.
05/02/2019: 09:00 a.m. - 5:00 p.m.
05/03/2019: 09:00 a.m. - 5:00 p.m.
05/04/2019: 09:00 a.m. - 5:00 p.m.
05/05/2019: 09:00 a.m. - 5:00 p.m.
05/06/2019: 09:00 a.m. - 5:00 p.m.
05/07/2019: 09:00 a.m. - 5:00 p.m.
05/08/2019: 09:00 a.m. - 5:00 p.m.
05/09/2019: 09:00 a.m. - 5:00 p.m.
05/10/2019: 09:00 a.m. - 5:00 p.m.
05/11/2019: 09:00 a.m. - 5:00 p.m.
05/12/2019: 09:00 a.m. - 5:00 p.m.
05/13/2019: 09:00 a.m. - 5:00 p.m.
05/14/2019: 09:00 a.m. - 5:00 p.m.
05/15/2019: 09:00 a.m. - 5:00 p.m.
05/16/2019: 09:00 a.m. - 5:00 p.m.
05/17/2019: 09:00 a.m. - 5:00 p.m.
05/18/2019: 09:00 a.m. - 5:00 p.m.
05/19/2019: 09:00 a.m. - 5:00 p.m.
05/20/2019: 09:00 a.m. - 5:00 p.m.
05/21/2019: 09:00 a.m. - 5:00 p.m.
05/22/2019: 09:00 a.m. - 5:00 p.m.
05/23/2019: 09:00 a.m. - 5:00 p.m.
05/24/2019: 09:00 a.m. - 5:00 p.m.
05/25/2019: 09:00 a.m. - 5:00 p.m.
05/26/2019: 09:00 a.m. - 5:00 p.m.
05/27/2019: 09:00 a.m. - 5:00 p.m.
05/28/2019: 09:00 a.m. - 5:00 p.m.
05/29/2019: 09:00 a.m. - 5:00 p.m.
05/30/2019: 09:00 a.m. - 5:00 p.m.
05/31/2019: 09:00 a.m. - 5:00 p.m.
06/01/2019: 09:00 a.m. - 5:00 p.m.
06/02/2019: 09:00 a.m. - 5:00 p.m.
06/03/2019: 09:00 a.m. - 5:00 p.m.
06/04/2019: 09:00 a.m. - 5:00 p.m.
06/05/2019: 09:00 a.m. - 5:00 p.m.
06/06/2019: 09:00 a.m. - 5:00 p.m.
06/07/2019: 09:00 a.m. - 5:00 p.m.
06/08/2019: 09:00 a.m. - 5:00 p.m.
06/09/2019: 09:00 a.m. - 5:00 p.m.
06/10/2019: 09:00 a.m. - 5:00 p.m.